The Return of DJ PREMIER!!! “CLASSICS” is the hip hop party represents VISION. Their party has always been amazingly happening. 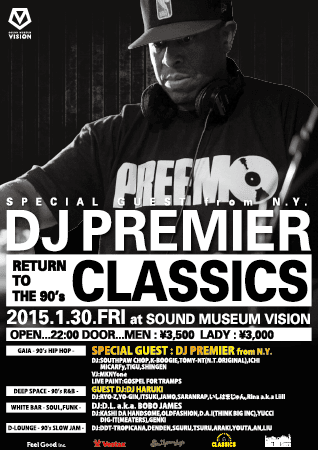 They will have great start of 2015 featuring DJ PREMIER. DJ PREMIER is charismatic DJ. He has been always at the top of hip hop scene since the end of old school era. This will be perfect guest DJ for “CLASSICS” introducing 90’s hip hop “The Golden Age”. DJ PREMIER came to VISION last time in spring of 2012. It was legendary. People still talk about. So, we are looking forward to “New Legend”.